Small updates and changes can make all the difference to a classical design. 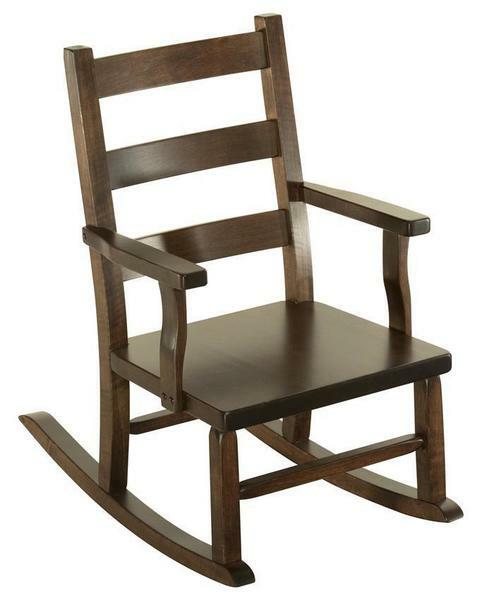 The Elizabethtown Kids' Rocking Chair is built to one such design, with its straight lines and classical ladder back tracing their heritage back to the very earliest days of Amish culture. Each piece of the Elizabethtown is handcrafted to order from solid wood in a small Amish woodshop using techniques as old as the culture itself, with every inch crafted with the kind of heirloom quality that will keep the Elizabethtown strong and beautiful through generations of kids, grandkids, and great-grandkids in search of a safe and comfortable spot for relaxing. Your Elizabethtown will be crafted to order from your choice of wood and then finished in your choice of stain. If you've any questions at all about this piece, or if you would like to talk with us about having the woodshop create a custom kids' rocking chair specifically designed for your needs, please don't hesitate to get in touch with us by phone or by email at any time. We love the truly heirloom quality showcased in this piece, and we would love to talk with you about the irresistible mix of classical and contemporary beauty it brings to the family home. 15" x 23" x 25"